CAMPAIGNERS battling to name one of the navy’s new breeds of frigates after Portsmouth of told of their disappoint after the effort fell through. 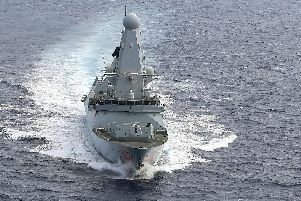 Former council leader Donna Jones had been at the centre of a bid to name one of the Type 26 frigates HMS Portsmouth. The warships are the latest in a breed of super-advanced frigates set to be based at Devonport, in Plymouth. However, the defence secretary Gavin Williamson this week revealed the name of the last ship in the eight-strong fleet would be HMS Edinburgh. Portsmouth Tory chief Councillor Jones was slightly disappointed by the news but insisted the blow would not kill her bid to have a warship named after the city. She is now turning her attention towards the second batch of five cheaper, general purpose frigates, the Type 31e, which are expected to be based in Portsmouth – if the plan to build them doesn’t fall through. The project for the Type 31e stalled when no initial bids by industry groups were accepted by the Ministry of Defence – which is working to a strict budget of the £1.25bn or £250m per ship. Cllr Jones said: ‘I’m pleased that Edinburgh has been recognised as a city in the naming of the newest Type 26. ‘It would be such a fantastic endorsement to the city of Portsmouth to have one of the new frigates named HMS Portsmouth, particularly the new Type 31s in the frigate class, which are likely to be base ported in Portsmouth.